Fred Graute has brought out another new version of MiniTime, his application for displaying the date and time in a small icon or window, without taking up too much space or generally getting in the way of your day to day use of the computer. 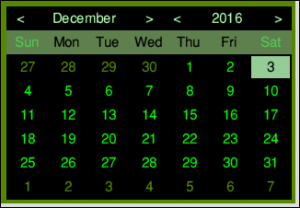 The calendar window can now have an optional title bar, which provides an easy way to move it to a different position on screen. There is now an option to ‘Keep screen position’ which, when enabled, allows the time window to return to its previous position after it has been moved by task. An Adjust click on the previous or next year or month now results in those items cycling in the opposite direction. The ‘Catch mode change’ option that was in previous versions didn’t actually do anything – there was nothing in the program that acted on the option, so this has now been removed. The application’s windows are now repositioned when the desktop font or screen mode is changed. The calculation of the maximum width of the time string (in order to know how wide the window should be to display it) is now more robust. The program now ensures that the sprite ‘ptr_point’ is present in the wimp sprite pool. The software was inspired by an earlier application by James Freeman, called SmallTime, which performed a similar task. The problem was that while SmallTime was clearly a useful application, it was never updated to run on 32-bit platforms, and was not released under a licence that would allow distribution of newer versions, updated by third parties. With no way to update and release new versions of SmallTime, writing a new application that could achieve the same ends was the obvious solution – and so MiniTime was born. Fred has released MiniTime under the three clause BSD licence, and its source code is included, meaning it can be modified and freely distributed by anyone. Voting is now open in the RISC OS Awards 2016!